We’re used to titles summing up horror movies. The likes of Hospital Massacre, Sorority House Massacre, etc, don’t leave much to the imagination, and little of it is apparent in the finished product. 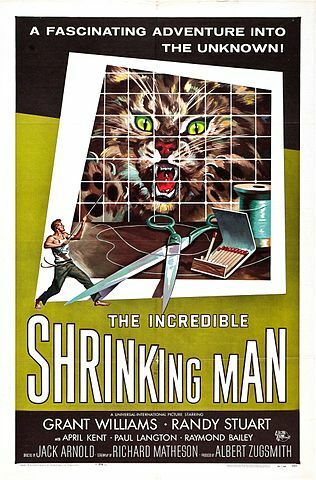 The Incredible Shrinking Man, while not a horror film in the traditional sense, is pretty darn horrifying. An obvious title that lays bare the plot, belies a very interesting, thoughtful, and quirky little movie. Yes, there’s a man. And he’s shrinking. And that’s all you need to know. This movie sells itself with a terrific premise. Soon thereafter, Scott begins to shrink…shedding pounds and inches of height. He undergoes a battery of tests, but there’s nothing that can be done.